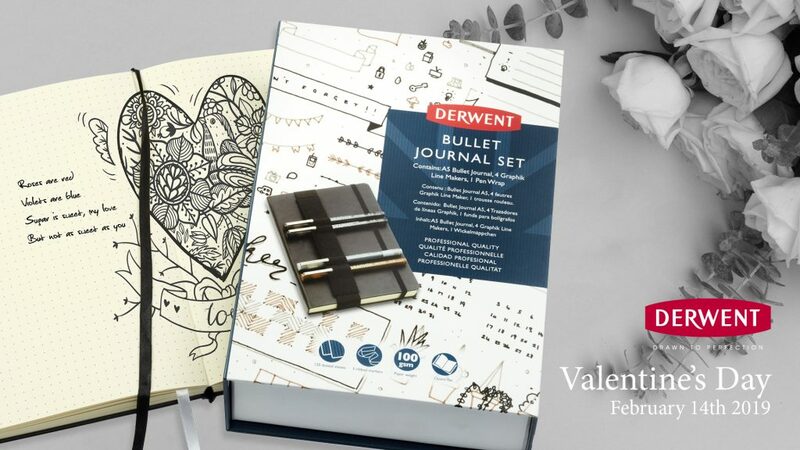 January 2019 – Love is in the air this Valentine’s Day and Derwent are asking couples to get creative when it comes to their gifts – with a selection of art materials to make crafters, illustrators and artists blush. From pencils and pens to organisational tools, the world leading art materials brand have a collection of colourful items to make lovers dewy-eyed. Starting the year off right, organisation should be top of the list. If your better half loves to doodle and organise, then the Derwent Sketching Journal Set is the perfect present. A gorgeous journal is partnered with four Line Makers pens for creativity on the go – either for sketching beautiful landscapes, drawing eye-catching portraits or just doodling whilst your mind wanders. If your partner is more of an ardent artist, then the Derwent Inktense Wash Set might just be the eye-catching and heart grabbing gift you’re after. Featuring eight, vibrant Inktense Pencils and a spritzer in a metal tin etched with the Derwent logo, this set is certain to be a hit with artists and creatives looking for bold colours and delicate washes. For something grander and bolder, Derwent’s wooden box sets definitely set hearts all-a-flutter. Containing either 24, 48, 72 or the 120 pencils, these sets – presented perfectly in a maple oak box – are guaranteed to be a hit with husbands, wives, boyfriends and girlfriends alike. Prices start at £54.99 and are available in Procolour, Watercolour, Coloursoft or Inktense Pencils. Simply pick your partners favourite and we’ll do the rest! Whilst you’re going the extra mile to impress your loved one, why not grab some of Derwent’s popular pencils for yourself and create a Valentine’s Day card with a difference? Derwent have a wide selection of art materials to suit every style, meaning you can craft a card guaranteed to win hearts this February. Plus, this Valentine’s Day, our team of Cupids are offering a wrapping service that will put your gift into a unique Derwent box, topping it off with a tidy bow and gift tag*. Find out more at DerwentArt.com or by following Derwent on social media – @derwentartofficial on Facebook and @Derwentpencils on Twitter and Instagram.